External Affairs Ministry in New Delhi said all Indians in the mission were safe and six terrorists, who carried out the attack, were dead. While two terrorists blew themselves up, four militants were killed by the Afghan National Police. The Consulate was damaged in the attack. The ministry has received an initial report of the attack and subsequent developments by the Afghan Army. Eight civilians have been killed in the crossfire, the Indian security sources said based on primary reports from the attack site. There were as many as 1,320 explosions, including bomb and grenade blasts during a nearly two-hour gunbattle. The initial onslaught was countered by the Indo-Tibetan Border Police (ITBP) which was later joined by the Afghan securitymen. According to Provincial Police Chief one suicide bomber detonated his explosives near the front gate of the Consulate to open the way for other attackers. Today’s attack is fourth in the series of terror strikes on the Indian Consulate in Jalalabad. It was attacked twice by hand grenades in 2007 and in 2013, it was attacked by three suicide bombers. In 2015, an attack on it was thwarted by the Afghan security forces. 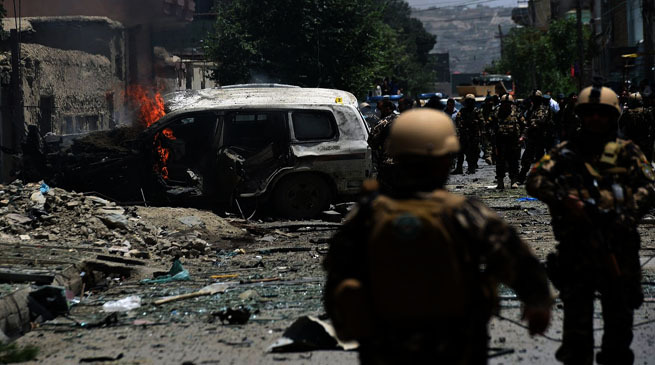 Two months ago, heavily-armed terrorists carried out an attack on the Indian mission in Mazar-e-Sharif which lasted for over 25 hours with all the attackers who attempted to storm the building getting killed by the Afghan forces. Soon after that also in January, Islamic State jihadists claimed responsibility for a deadly gun and bomb siege targeting the nearby Pakistani consulate in Jalalabad.